As a successful freelance blogger, I am often asked by clients and peers if there is a secret to making money blogging. There is no magic recipe, but an important ingredient is building trust. Any decent relationship is built on trust. Without it, you have nothing more than two people in a room. Violate it…and you’ll spend a lifetime working (often unsuccessfully) to get it back. Earning and maintaining the trust of a significant other is hard enough, but a bloggers’ job is even tougher. You need to earn/maintain the trust of strangers. Hopefully, lots on them. Building trust doesn’t happen overnight, but it’s an important ingredient to cook up a winning product. Here are few tactics to employ in order to build trust on your blog, and in turn, become a better blogger. – BE YOURSELF. Successful blogging requires that you insert yourself into the written world. Not every blogging situation calls for it, but if you are looking to build an audience and earn readers’ trust, you need to give them (at the very least) a glimpse into who you are. We trust people we know, and if readers don’t know you, how can they trust you? – STICK WITH IT. The longer you blog, the better your odds of earning trust. It shows people that you are in it for the “long haul.” In a world where many blogs fizzle and disappear after a few weeks, readers will not vest themselves until you prove that you will not “abandon” your blog. Also, the longer you keep you blog running, the more you prove your commitment (not to mention, search engine love). Quality beats quantity, but standing the test of time will earn you some clout. – BE ACTIVE AND CONSISTENT. We trust people we can depend on. Get readers to depend on you, not only with the content you provide, but when you post it. – BE AN AUTHORITY. Talk to folks within your blog’s niche to boost your “street cred.” Like it or not, people are judged by the company they keep. If you are blogging about cat whiskers, and are connected to the President of the local Cat Whiskers club, you will instantly garner respect from your readers. At the very least, you’ll prove you have some knowledge of what you are writing about. – TALK YOURSELF UP. There’s a fine line between highlighting your success and being a braggart, but with a little bit of grace, you can achieve the former. Don’t be afraid to put your impressive blog stats out there for the world to see. 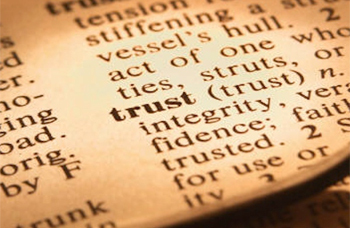 If there are things going on behind the scenes that could increase your trust quotient, use ‘em! Bloggers need to build trust in order to be successful. What are you doing to build that bridge?